Born in the Castle of Xavier near Sanguesa, in Navarre, 7 April, 1506; died on the Island of Sancian near the coast of China, 2 December, 1552. In 1525, having completed a preliminary course of studies in his own country, Francis Xavier went to Paris, where he entered the college de Sainte-Barbe. Here he met the Savoyard, Pierre Favre, and a warm personal friendship sprang up between them. It was at this same college that St. Ignatius Loyola, who was already planning the foundation of the Society of Jesus, resided for a time as a guest in 1529. He soon won the confidence of the two young men; first Favre and later Xavier offered themselves with him in the formation of the Society. Four others, Lainez, Salmeron, Rodriguez, and Bobadilla, having joined them, the seven made the famous vow of Montmartre, 15 Aug., 1534. After completing his studies in Paris and filling the post of teacher there for some time, Xavier left the city with his companions 15 November, 1536, and turned his steps to Venice, where he displayed zeal and charity in attending the sick in the hospitals. On 24 June, 1537, he received Holy orders with St. Ignatius. The following year he went to Rome, and after doing apostolic work there for some months, during the spring of 1539 he took part in the conferences which St. Ignatius held with his companions to prepare for the definitive foundation of the Society of Jesus. The order was approved verbally 3 September, and before the written approbation was secured, which was not until a year later, Xavier was appointed , at the earnest solicitation of the John III, King of Portugal, to evangelize the people of the East Indies. He left Rome 16 March, 1540, and reached Lisbon about June. Here he remained nine months, giving many admirable examples of apostolic zeal. On 7 April, 1541, he embarked in a sailing vessel for India, and after a tedious and dangerous voyage landed at Goa, 6 May, 1542. The first five months he spent in preaching and ministering to the sick in the hospitals. He would go through the streets ringing a little bell and inviting the children to hear the word of God. When he had gathered a number, he would take them to a certain church and would there explain the catechism to them. About October, 1542, he started for the pearl fisheries of the extreme southern coast of the peninsula, desirous of restoring Christianity which, although introduced years before, had almost disappeared on account of the lack of priests. He devoted almost three years to the work of preaching to the people of Western India, converting many, and reaching in his journeys even the Island of Ceylon. Many were the difficulties and hardships which Xavier had to encounter at this time, sometimes on account of the cruel persecutions which some of the petty kings of the country carried on against the neophytes, and again because the Portuguese soldiers, far from seconding the work of the saint, retarded it by their bad example and vicious habits. By July, 1547, he was again in Malacca. Here he met a Japanese called Anger (Han-Sir), from whom he obtained much information about Japan. His zeal was at once aroused by the idea of introducing Christanity into Japan, but for the time being the affairs of the Society demanded his presence at Goa, whither he went, taking Anger with him. During the six years that Xavier had been working among the infidels, other Jesuit missionaries had arrived at Goa, sent from Europe by St. Ignatius; moreover some who had been born in the country had been received into the Society. In 1548 Xavier sent these missionaries to the principal centres of India, where he had established missions, so that the work might be preserved and continued. He also established a novitiate and house of studies, and having received into the Society Father Cosme de Torres, a Spanish priest whom he had met in the Maluccas, he started with him and Brother Juan Fernandez for Japan towards the end of June, 1549. The Japanese Anger, who had been baptized at Goa and given the name of Pablo de Santa Fe, accompanied them. After working about two years and a half in Japan he left this mission in charge of Father Cosme de Torres and Brother Juan Fernandez, and returned to Goa, arriving there at the beginning of 1552. Here domestic troubles awaited him. Certain disagreements between the superior who had been left in charge of the missions, and the rector of the college, had to be adjusted. This, however, being arranged, Xavier turned his thoughts to China, and began to plan an expedition there. During his stay in Japan he had heard much of the Celestial Empire, and though he probably had not formed a proper estimate of his extent and greatness, he nevertheless understood how wide a field it afforded for the spread of the light of the Gospel. With the help of friends he arranged a commission or embassy the Sovereign of China, obtained from the Viceroy of India the appointment of ambassador, and in April, 1552, he left Goa. At Malacca the party encountered difficulties because the influential Portuguese disapproved of the expedition, but Xavier knew how to overcome this opposition, and in the autumn he arrived in a Portuguese vessel at the small island of Sancian near the coast of China. While planning the best means for reaching the mainland, he was taken ill, and as the movement of the vessel seemed to aggravate his condition, he was removed to the land, where a rude hut had been built to shelter him. In these wretched surroundings he breathed his last. It is truly a matter of wonder that one man in the short space of ten years (6 May, 1542-2 December, 1552) could have visited so many countries, traversed so many seas, preached the Gospel to so many nations, and converted so many infidels. The incomparable apostolic zeal which animated him, and the stupendous miracles which God wrought through him, explain this marvel, which has no equal elsewhere. The list of the principal miracles may be found in the Bull of canonization. 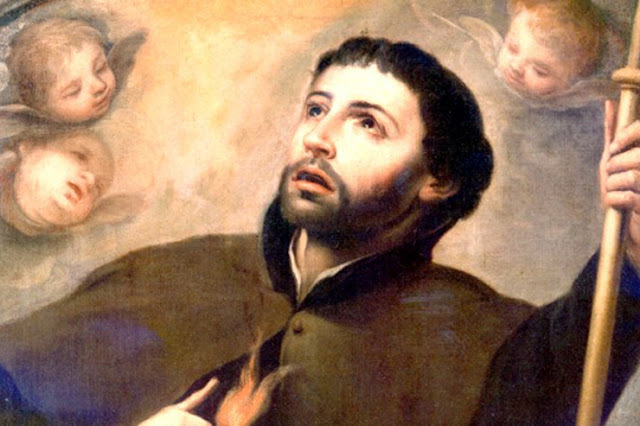 St. Francis Xavier is considered the greatest missionary since the time of the Apostles, and the zeal he displayed, the wonderful miracles he performed, and the great number of souls he brought to the light of true Faith, entitle him to this distinction. He was canonized with St. Ignatius in 1622, although on account of the death of Gregory XV, the Bull of canonization was not published until the following year.